Switzerland meets China in this surprising, but excellent concoction. Like many emulsified sausages, Swiss Deli Cervelas are meant to be poached prior to consumption, but not often in a spicy Oriental stock. 1. Simmer the chicken stock with the star anise, grated ginger, teriyaki sauce and Cervelas for ten minutes. 2. 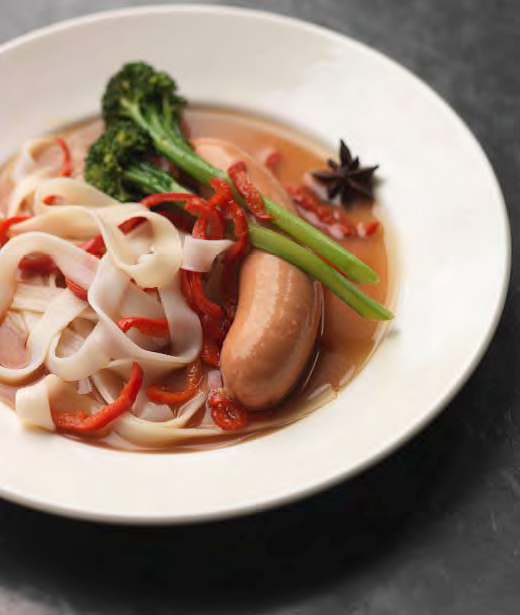 As the stock simmers, stir-fry the long-stem broccoli and red pepper for a couple of minutes over fierce heat, stirring constantly. Transfer to the spiced stock, then stir in the noodles and serve immediately.